The Bag Boy Company, the leader in walking carts since 1946, has its spotlight on their Navigator Quad Electric Cart this spring as the weather starts to break. It was first introduced three years ago, and since its debut, the Navigator Quad’s popularity continues to grow; last year’s record sales solidified its most successful year to date. “Walking the course has never been easier. This cart is simple and easy to use, it really is the closest thing to having a caddy” said Pat Gallagher, Product Manager at Bag Boy. “The electric cart market continues to grow, as many people are opting to walk rather than ride.” Many people have caught on to the walking cart trend recently, as it is an easy way to incorporate being more active and healthy. 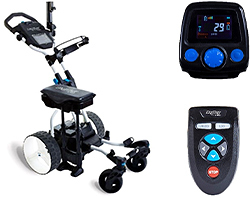 The Navigator Quad is the best-selling electric cart on the market, featuring advanced digital electronics, such as the odometer, patented gyroscope ‘anti-deviation’ technology, which keeps the cart on track across any terrain. Its fully directional remote control allows for left, right, forward, reverse, and speed control. In addition to the Navigator Quad’s 4-wheel engineering with swivel front wheels, the standard, fully retractable 5th wheel ensures added uphill stability. It comes equipped with a multi-functional handle with adjustable height, soft rubber grip, integrated built in GPS/mobile device holder and solar charger holder. The Navigator Quad’s standard accessories include the cart seat, umbrella holder and the universal beverage holder. Inquire about our fleet specials and demo programs. Founded in 1946, the Bag Boy Company has built a reputation for unmatched quality, unbelievable durability and unsurpassed innovation and design. Bag Boy designs, manufactures and distributes a full line of award-winning, feature-loaded golf bags, push carts, travel covers and accessories designed for a golfer's on-course convenience and comfort. For more information, please visit www.bagboy.com. Follow us at www.facebook.com/bagboygolf, twitter.com/BagBoyCompany and www.linkedin.com/showcase/bag-boy-company. Established in 2004, Dynamic Brands is the parent company for a portfolio of premium brand name companies committed to the development of innovative, high-quality products and supported with outstanding customer service in the sporting goods industry. Golf and recreational products are offered through Bag Boy, Burton, Datrek Golf, Devant Sport Towels, IGOTCHA, Riksha, SEARCH 'N RESCUE and FLAGPOLE-TO-GO brands, and include walking carts, golf bags, travel covers, custom sport towels, bag tags, golf ball retrievers, flags and accessories. Dynamic Brands' products are marketed in 87 countries worldwide. For more information, please visit www.dynamicbrands.com. Follow us at www.facebook.com/dynamicbrandsrva and www.linkedin.com/company/dynamic-brands.